Madeline Howard is a penname of author Teresa Edgerton. Maps, pronunciation guides, and videos are available at Madeline Howard’s website. 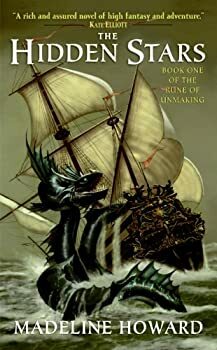 The Rune of Unmaking — (2004-2007) Publisher: Extraordinary new talent Madeline Howard begins an epic trilogy of magic and power, hidden birthrights and prophecies, with The Hidden Stars, the first book of The Rune of Unmaking. In a world devastated by a cataclysmic war between the wizards and mages, the Empress Ouriána has seized the throne, proclaiming herself the Divine Incarnation of the Devouring Moon. Appointing twelve priests to perform her rites, she rules with a tight rein of evil sorcery. The priests, once men, have become twisted with magic, making them monstrous — mutated. They bring destruction wherever they ride, and one kingdom after another falls, enslaved into darkness. Yet signs and portents appear, puzzling the seers, and a tale begins to grow. A rumor of a young girl, talented and hidden, who is destined to end Ouriána’s tyrannous reign… if she can survive long enough to do so. And so a brave band of wizards and heroes ride out in search of the hidden princess, pursued by the fury of the dark goddess herself. A small band of wizards and warriors must find the lost royal child prophesied to end the reign of an 'evil', self-proclaimed goddess-empress. Adapting that main plotline from Willow, Madeline Howard's novel The Hidden Stars further combines several Tolkien-esque elements (wondrously dexterous elves/fey; vastly powerful wizards; not nine but twelve misshapen servants of the villain) to create an initially promising but unfortunately disappointing fantasy experience.